Computed tomography imaging can assess both the heart and the lungs in a single, rapid diagnostic test. There is an important overlap between cardiovascular and respiratory diseases, which may be mediated through shared aetiologies, such as smoking, or shared pathological mechanisms, such as inflammation. Cardiovascular disease may be identified on imaging performed to assess respiratory disease and vice versa. Abnormalities of the right heart can be a common endpoint of a variety of causes of pulmonary hypertension including thromboembolic, respiratory and cardiac diseases. Coronary artery calcification can be used as a marker of the presence of coronary artery disease in patients being assessed with CT for respiratory disease. Incidental extra-cardiac findings in the lungs are frequently identified on cardiac CT and may have important clinical and economic implications. 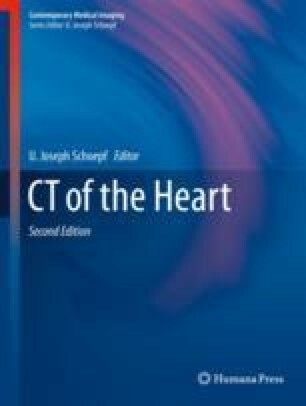 Thus imaging of the heart-lung axis is an important feature of CT imaging of the heart, where the radiologist plays a key role in providing insight and helps triage the patient to appropriate care pathways. Steiner RM, Budoff MJ, Khurram N, Kinney GL, Hokanson JE, Barr RG, Nath H, Lopez-Garcia C, Black-Shinn J, and Casaburi R. Coronary artery calcium on non-contrast thoracic CT scans; comparison of ECG gated and non-gated examinations in patients from the COPD gene cohort. In A2616–16. American Thoracic Society. 2011. doi: https://doi.org/10.1164/ajrccm-conference.2011.183.1_MeetingAbstracts.A2616. WHO. 2012. Mortality attributable to tobacco. http://www.who.int/tobacco/publications/surveillance/rep_mortality_attributable/en/. Ye C, Younus A, Malik R, Roberson L, Shaharyar S, Veledar E, Ahmad R, et al. Subclinical cardiovascular disease in patients with chronic obstructive pulmonary disease: a systematic review. QJM. 2016; https://doi.org/10.1093/qjmed/hcw135.